The glowing star systems have revealed a new way to power some of the most powerful objects in the universe. Glowing "jellyfish" galaxies have revealed a new way to power some of the most powerful objects in the universe. The same process that feeds the most voracious black holes at the galactic centers may also create dangling "tentacles" of newborn stars, a new study found. While most galaxies, including the Milky Way, hide massive black holes at their centers, only a few produce enough electromagnetic radiation as they eat to create active galactic nuclei (AGN). AGN shine brilliantly in the universe, and why they form around some black holes and not others has been an ongoing mystery. But jellyfish galaxies may help crack the case. This same wind that forms the jellyfish galaxies may also feed growing AGNs, she said. Poggianti, a researcher at the INAF-Astronomical Observatory of Padova in Italy, is part of an international team of scientists using the Multi-Unit Spectroscopic Explorer (MUSE) instrument on the European Space Observatory's Very Large Telescope (VLT) in Chile to examine jellyfish galaxies. The researchers found that an unexpectedly high fraction of the tentacled galaxies contain AGN. 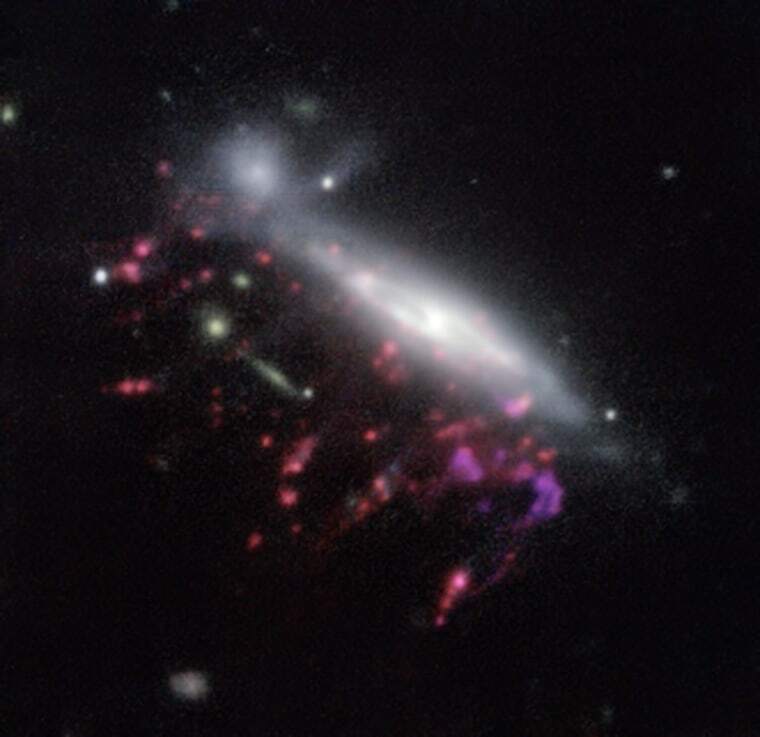 "Ours is the first study that systematically searches for [jellyfish galaxies] and tries to have a complete census in different regions of the local universe," Poggianti said. Supermassive black holes constantly feed. As they draw in surrounding gas and dust, they produce intense radiation that can sometimes be seen from Earth, leaving scientists to ponder these objects' food source. While black holes are common, the more powerful and visible AGN are rare. Poggianti and her team are part of an ongoing program to observe 114 jellyfish galaxies, an order of magnitude more than previously observed in detail, she said. Of the seven galaxies with the longest tails, the researchers found that six housed a supermassive black hole, suggesting a link between the two types of object. Previous studies suggested that the powerful cluster winds stretched the tentacles out for tens of light-years in a process known as ram-pressure stripping. These same winds could feed the supermassive black holes, constantly nourishing them by carrying material to the center of the galaxy. But, the scientists wondered, did the winds feed the black holes, or did the black holes produce the winds? "In a sense, this is similar to the problem of the chicken and the egg — which one comes first," Poggianti said. "While both effects are probably at work, we have good reason to think that the first effect prevails." By studying the positioning and velocity of the galaxies, the researchers found that all of these objects lie close to the center of the cluster and have high speeds compared to that of the cluster itself. "They are in the ideal conditions for ram-pressure stripping to be the strongest," Poggianti said. On the other hand, if effects from the galactic center formed the massive tentacles, she said, the galaxies would be scattered more randomly. As cluster winds sweep away the dust and gas in a galaxy, the tentacles they create fill with brilliant young stars. These stars shine brightly in optical wavelengths of light, making the objects stand out to researchers who picked through images of over 70 galaxy clusters hunting for tails, Poggianti said. The scientists also found jellyfish outside of clusters, some as part of galaxy groups and others off on their own. Galaxies found in groups tend to lack the spectacular tails of their cluster compatriots, and all of those found with AGN lie in clusters, Poggianti said. Simulations combining ram-pressure stripping and AGN-hosting galaxies would be both complicated and computationally expensive, requiring significant time and computer power, Poggianti said. That's why no such simulations exist — yet, she said. "I imagine that, following our discovery, there will be research groups in the world that will attempt to simulate the two processes together," she said. The paper said that such simulations would be valuable for interpreting the new connection. "When all of the observations will be in our hands — I expect [in] about a year from now — we will be able to have a complete picture," Poggianti said. Once the researchers have obtained all of the data, the team will be able to see how features change and evolve. Observing the jellyfish — some at the beginning of gas removal, others with long tails and still others devoid of gas with no fuel to birth young stars — will allow the researchers to investigate the various stages of the jellyfish lifecycle, Poggianti said. "This is like seeing galaxy evolution happening in front of your eyes from a front row," she said. The team is planning, and in some case already working, to observe the galaxies at different wavelengths with the Karl G. Jansky Very Large Array in New Mexico and the Atacama Pathfinder Experiment and Atacama Large Millimeter/submillimeter Array in Chile, Poggianti said. Such observations will help researchers to understand how gas in the jellyfish galaxies evolve over time, she said. "This is really great, because these are the most powerful astronomical observational facilities in the world, each in its own field and wavelength," Poggianti said. "Their combination will allow us to study all the different gas phases, [and] how they relate to each other and to the formation of new stars."